Live your best life at Marriott's Barony Beach Club. Perfectly located on the beautiful oceanfront of Hilton Head Island, South Carolina, our vacation ownership beach resort offers an incredible backdrop for creating a lifetime of memories. Feel at home in our spacious two-bedroom condo-style villa rentals, with a living room, separate dining area, a fully-equipped kitchen and furnished balcony. 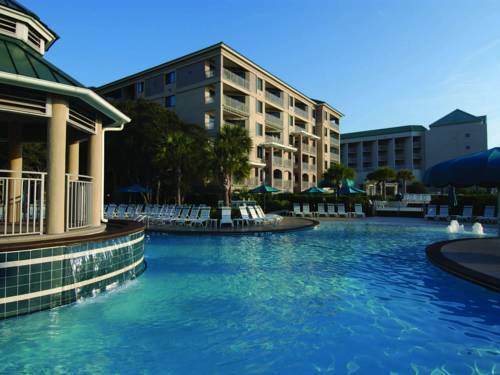 Spend days playing on the beach, learning to paddleboard, relax by one of our indoor and outdoor pools, touring Hilton Head on our bikes or challenging your family to games including bocce, table tennis and more. Workout in our 24-hour fitness center, then head to our enticing spa for some well-deserved pampering. When you are ready to explore, you'll find some of the area's most popular attractions within reach, including Shelter Cove, Harbour Town and Coligny Plaza. Whether staying with us for a romantic weekend or on a family getaway, we look forward to welcoming you soon to our beachfront resort on Hilton Head. All Y'all's Bar & Grill: Take a break from cooking and enjoy casual dining in our Hilton Head Island resort's restaurant. Savor freshly prepared burgers, sandwiches and salads, as well as tempting desserts and cocktails, indoors or on the deck overlooking the pool. The Marketplace Express: Stop by our shop to pick up snacks, treats, Starbucks coffee, or other drinks to take to the beach or on your adventures around Hilton Head and South Carolina. We carry an assortment of sundry items you may need for your stay in our vacation villas.